Effectively marketing your business has always been about finding a way to stand out from the pack. After all, grabbing their attention is the first step in client conversion. But the act of drawing customers in has truly become an uphill battle in a world so heavily saturated with choice. Hick’s Law, which is often summarized as “the paradox of choice,” states that when people are presented with more options, the time they take to make a decision actually goes up rather than down. We need to learn to empathize with the paralysis customers feel when trying to make a choice and actively address it if we want to win their business. But in a world of too many options, what tactics can you use to make their decision easier? I recently partnered with my friends over at icuc.social to unpack this heady subject. 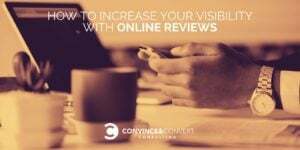 We put together both a webinar and an ebook that delve into why you need to start focusing on online reviews today if you want your business to thrive. It’s all about understanding and harnessing the power of reviews and how you can turn ratings into revenue. Below are just a few highlights from our collaboration. The goal of every single business owner on the planet is to have customers and make money. (If they say it’s something else, they are lying. Or they don’t understand their own business.) So while being “the best-kept secret in town” may seem like a compliment on some level, it’s really the opposite. In the end, being obscure is a great way to become obsolete. Ensuring that you have plenty of quality online reviews is a crucial first step for getting bodies in the door or eyeballs on your site. Those businesses with the most reviews and highest average ratings are going to get more traffic both digitally and physically than those with very few reviews. Let’s be real: By and large, consumers simply no longer trust businesses. You can scream from the mountaintops all day long about how awesome you are, but if that sentiment isn’t being echoed by your customers, their peers will take note. Ratings and reviews have become a reputational shortcut—a digital marker of quality if you will. And despite largely being penned by strangers, we seem to have collectively agreed that online reviews are trustworthy, as 85 percent of consumers say they trust some online reviews as much as personal recommendations from family and friends. Better yet, studies show that customer confidence in these online reviews is increasing every year. Ignore their influence at your own peril! Bad reviews are the worst. But get used to it; they’re part of the deal. You can’t prevent them, you can’t erase them, but you can control how you respond to them. Did you know that the simple act of addressing a negative review increases the chance that customer will patronize your business again by 16 percent? However, when you choose not to respond, that number decreases by 37 percent. And, frankly, no response is still a response. Silence says so much; it tells your customer that you don’t care enough about their negative experience to even acknowledge it, which only serves to make a bad situation worse. Every single review is an opportunity to learn more about your customers and how to communicate with them effectively. In addition, you must realize that responding to a customer, whether they’ve said something positive or negative, is not just about answering them alone. Your whole audience is watching how you interact with your online reviews. The economic impact of how you to choose to engage here is so much broader than this one customer. It’s not enough to amass a pile of good reviews one time. Your review stream must be steady and continuous. 77 percent of customers now say that reviews more than 90 days old are irrelevant, so you’ve got to focus on keeping things fresh at all times. Google’s algorithm openly rewards businesses that have what they call “high review velocity.” In other words, businesses with more reviews and that are reviewed more frequently are ranked more prominently in search results. The problem is that generating reviews isn’t as simple as you might hope. 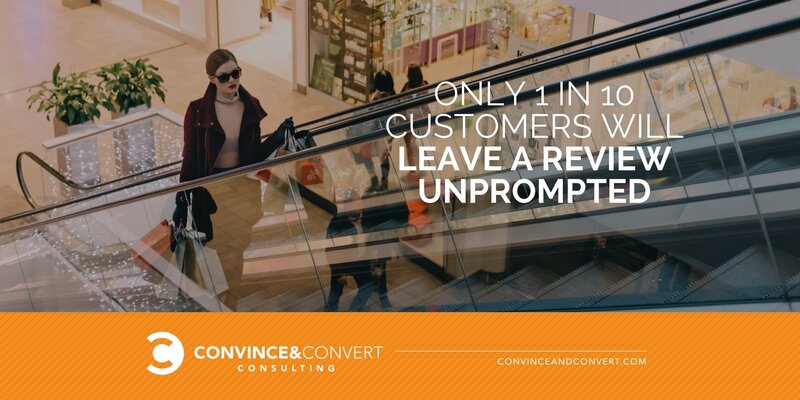 An average of just one in ten customers will leave a review unprompted. The other nine? They’re too busy living their lives to spend time writing essays about your product or service. But if you reach out and ask them for their feedback, a staggering amount of them will at least consider it. How, then, do you ask? Most marketers would assume that providing customers with incentives—whether in the form of discounts or cold hard cash— would be a surefire way to get them to compose a review, right? Wrong. Studies show that, in fact, the opposite is true. Just as consumers seem to trust their peers over a business’s marketing campaign, they also seem to resent the feeling of being “bought” that accompanies incentivized review programs. You’ve got to do better than that if you want their honest feedback. Reaching out to consumers locally and cultivating ongoing reviews there is the fastest way to boost your customer base. After all, 76 percent of all online searches for local business result in foot traffic within 24 hours. Those people are going to go somewhere for their meatball sub or their monogrammed towels; how do you make sure they find their way to you? Well, by making sure they’re able to find a plethora of positive, detailed reviews about why they should, of course. Far too many businesses leave review generation and management up to fate. Do. Not. Do. That. You’re leaving money on the table every single day by neglecting to nurture this aspect of your brand presence. Providing canned responses to reviews is just as bad. Customers can tell when you’re doing that. And while automation can help in some instances, it really robs the interaction of the nuanced tone that comes from engaging with a real person. Online reviews are a great way to create brand ambassadors and loyalists, but you’ve got to dig in deep and engage with people one-on-one to really reap the rewards. We’ve just scratched the surface here of how to tap into the power of online reviews. To go more in-depth with us—including a detailed discussion of case studies from icuc.social customers e.l.f. and Boston Pizza, plus my no-fail rule for handling replies to online reviews—you can check out the webinar here.